It was the Fourth of July, and I emerged from my tent in the early morning hours at the Alley Spring campground. Dozens of families snoozed quietly in their tents near the sounds of the river, as they rested before the festivities of the Fourth. 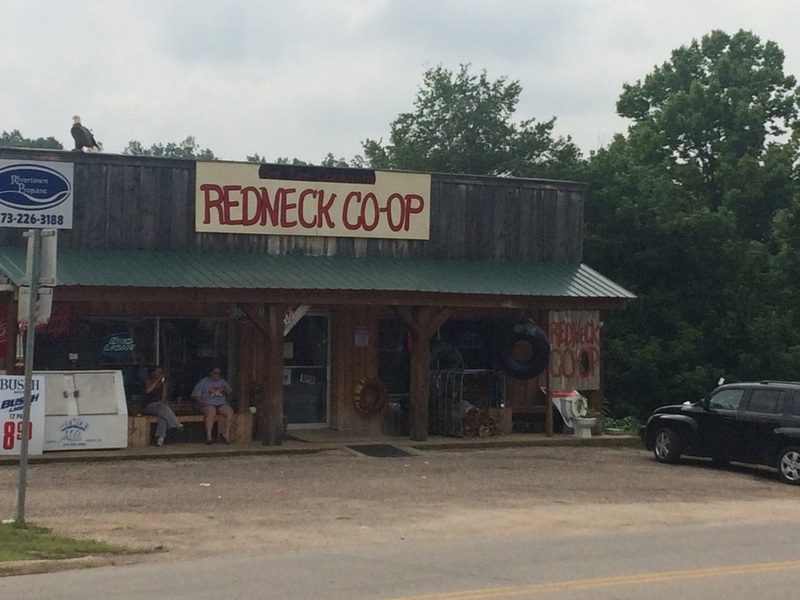 I packed my bike and rode several miles over the brutal hills of the Ozarks into the town of Eminence, past the comically named Redneck Co-op, to a small cafe where I joined two other cyclists for breakfast. Lindsey was a forestry major traveling to Colorado escorting young Zeke as he made his way back to his home in Berkeley. We swapped stories over pancakes, fueling up for some of the steepest hills of the trip. As the sun climbed toward the center of the sky, the heat seemed to boil my skin until I was bathing in sweat. I enjoyed gazing down at the rivers and lakes that appeared sporadically through the dense overbrush as I reached each precipitous summit before arriving in Emeryville in the late afternoon. I contacted the police to get the code to their bike hostel, which had been recommended by some cyclists several towns back. The hostel was offered by the city for a requested donation of several dollars, and was housed in a modest building with cots, air conditioning, and a shower. It was a magnificent find, and I had the whole place to myself. I cleaned up and made my way into town to ask about their firework show. I stopped by a fifties-style diner called Spooners, the only open restaurant in town, and the girl at the counter told me that I should go to the supermarket parking lot to watch the show, so I moseyed that way about an hour before dark. I set up my camera on a tripod and began filming people as they lined the parking lot to tailgate from their truck beds, lighting off firecrackers, drinking, and enjoying their families. Holidays, particularly drinking holidays, are hard for recovering alcoholics, and I found myself longing to be around close friends and family, drinking and celebrating. The old me would have bought a 30 pack of beer and some fireworks and made friends (or enemies) with the entire town. These kind of cravings defy all reason, but are incredibly powerful when you are an alcoholic, and I have learned to be hyperaware of my internal monologue and emotional states during holidays. Sometimes there is a thin line between thoughts and actions. I have learned that these kind of thoughts will arise in my mind without warning, reminding me how cunning, baffling, and powerful addictions can be. I recognized that I was being triggered to drink, and bought a root beer and guzzling the sparkling syrup while I stood in the parking lot, trying to fight off the sting of my solitude and momentary self-loathing. This was supposed to be a happy time, a celebration of our country's freedom and independence, yet I felt like a stranger in a strange land. My neon shoes, expensive camera, and decent grammar made me stick out like a sore thumb. The sky grew darker and I became surrounded by most of the people in the town as they tailgated. I was crawling in my own skin and felt as if everyone was watching me with distrustful eyes. Despite being around a crowd, I felt completely alienated and alone, and the signs from the nearby liquor store kept catching my glance. Just as this anxiety reached its peak, I was greeted by a man named Wires, who had a gentle spirit and introduced himself as a street preacher. I told him about my trip, and he got excited and explained that he had been taking to the streets for years telling people about Jesus, feeding needy families, and helping people get sober. He introduced me to a handful of young men and women that were recovering addicts and alcoholics in his recovery ministry, and they started to share their miraculous stories of recovery. Suddenly, the weight I had been carrying came off of my shoulders thanks to this simple encounter. I began to film a man in his twenties talk about his hopeless addiction to meth, explaining that he had overcome the impossible through his newfound faith, and was now a year sober. I had found my people: the once hopeless turned courageous, and I was immediately comforted. I shared my story and one of the girls murmured, "That kind of gives us hope. it is good to hear that people stay sober for years, and that it gets better." This was a strange thing to hear during a moment of temptation, but I was reminded that it had gotten a lot better the longer I had been sober. Although I had moments of anxiety and weakness and the occasional trigger, they had grown more and more rare with time, and I had learned the tools to overcome them. Each minor success carried me forward toward a lifetime of sobriety. The sky became black and explosions painted the darkness with colorful light. Wires showed me pictures on his phone of needy families they had been feeding through his ministry. He reached into a worn leather wallet and handed me a twenty dollar bill and explained, "my wife and I are just street preachers and don't have much, but we believe in what you are trying to do." That was exactly the kind of encouragement I needed in that moment, and after the popping finale of the fireworks show had illuminated the entire small town sky, I walked the three blocks back to the hostel, sober, while firecrackers exploded in all directions from the surrounding hills. I had regained my sense of purpose and found myself lying on my cot listening to the celebratory popping and hissing around the city, and realized that I will probably always have occasional temptations, but they will never be more than I can handle. The next day was as physically challenging as the last, but I conquered each horrendous climb with a new sense of determination. To be reminded of my purpose, I had needed to speak to the group of young adults still gritting their teeth from the challenges of new sobriety. I had needed to hear them on fire with the Spirit, hitting the streets and trying to save others from the toils of addictions. I remembered that a big piece of why I decided to ride across the country is because I wanted to provide hope to people in early sobriety. I chased the top of each hill with a newfound fury, thinking of the kids I was riding for, picturing my stories of this adventure helping even just one person make it through early sobriety toward a meaningful life. I rolled through Pilot Knob, and stopped to take a reverential moment to read the history of the Civil War battle that took place there in 1864, before arriving in Farmington, MO. I stayed at Al's Place, a cycling hostel organized by the city that has served thousands of cyclists since its inception in 2009. 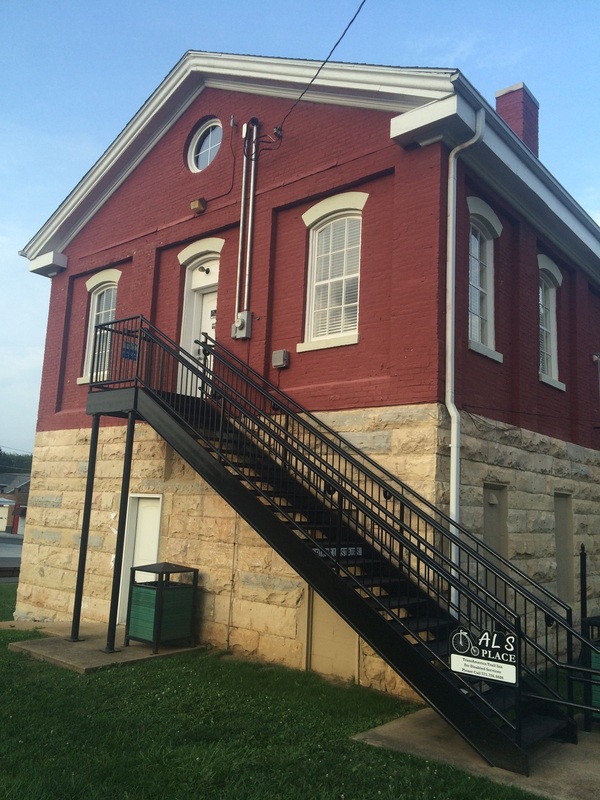 It was located in the historic Farmington Jail, and was named in honor of a local businessman and cycling enthusiast named Al who lost his battle with cancer. 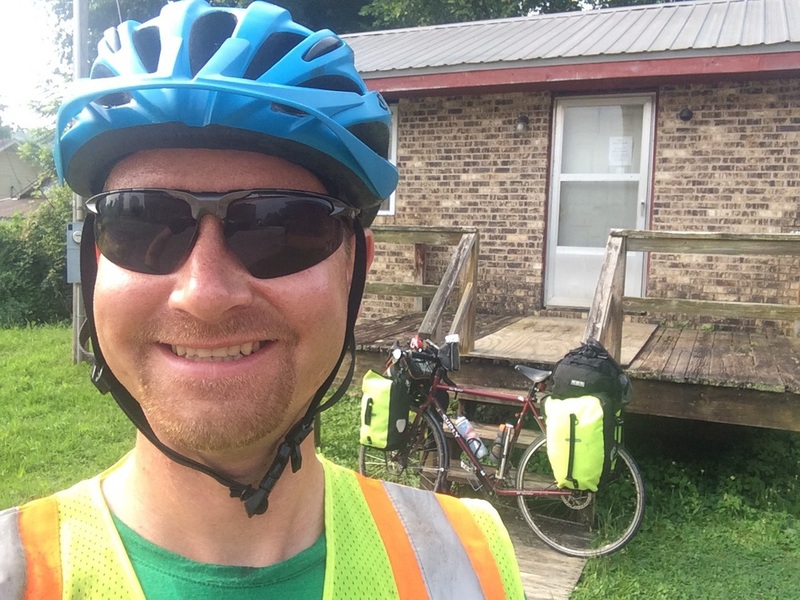 I had heard about this amazing hostel from other cyclists for three states, and had been told to plan a couple rest days there to recharge and regroup since it was only $20 per night and had everything I needed. It was immaculately decorated with hardwood floors, leather couches, framed cycling jerseys on the walls, bicycles on the ceiling, a laundry room, a full kitchen, cable TV, and high speed internet. Every last detail seemed to cater to the cycling tourer. I immediately washed my grungy clothes and settled in for the night in a comfortable bed. I had been waiting for several days to reach Farmington to get several things worked on at their bike shop (my derailer, chain, and wheel) and took them to TransAm Cyclery which was conveniently located across the street. While the repairs were being made, I explored the town of Farmington, which unlike so many other small towns, had signs of economic stability: it was well landscaped, had a thriving downtown, and had new construction happening. Somebody had graciously given me money to get a massage in the middle of the trip, so I took the liberty of getting a massage by Jennifer at Massage Works. I felt pretty spoiled. In the evening, a cyclist named Greg wearing a neon yellow smiley face jersey showed up to the hostel and heated up some chicken and dumplings for me that he had in his pack. Greg was an interesting character and we immediately bonded by our similar sense for adventure. He had worn many hats over the years mainly serving for 27 years on the LAPD working a foot beat in South Central Los Angeles which provided him with a lifetime of interesting stories about the riots and crack epidemic. He also had spent some years as a gym teacher, a coach of a variety of sports and ages, a National Park Ranger, and a mentor to at-risk kids. I found it rather inspiring that at age 60, he was not only cycling across the country, but had somewhat recently hiked the Pacific Crest Trail, a major four month feat of endurance on its own. As we talked, we discovered that we had the same bike, the same panniers, had left on the same day, the same appetite, and had the same general pace trying to enjoy the scenery and history of America as we passed. We decided to ride together for a few days, and began planning our next day while I cooked steaks with sautéed onions and mushrooms, potatoes, and veggies. It was so nice to be able to cook and eat a real meal and to have some great company with whom to share it. In the morning we snapped some pictures in front of Al's Place as we left with "the twins," aka our Maroon Surly Truckers, and got back on the road. Greg and I with "the twins"
It was incredibly overcast all day, and our bike maps took us through some winding scenic farm roads that had very little traffic, with pristine lakes and wildflowers scattered over rolling hills of grass. The clouds and shady trees brought the temperature down significantly, and having some company to share it with made it one of the most pleasant, joyful days of the entire trip so far. In the afternoon, we reached the Mississippi River. It was an amazing feeling to reflect on the fact that we had taken ourselves from the Pacific Ocean to the Mississippi River with just our legs. Greg and I cheered, high-fived, and took pictures in front of the bridge as I had my seventh state: Illinois. We crossed the bridge and rode into the town of Chester, the birthplace of Popeye. As we rolled into town, an elderly gentleman told us that we could stay at the Elks club for free and gave us directions. We arrived and got a key to a shack that they had set up in the back for free for cyclists called the "Shady Rest Motel," which I found rather comical as it looked a bit shady, but it was free, and I was grateful for any free spot to get horizontal. The inside had built-in bunks and a separate building with a shower and restrooms. We were greeted by Lexie and Sebastian, a young married couple traveling approximately 5400 miles from Berlin, Germany to the Pacific coast on their bikes (although they took a boat from Europe to New York). Despite being vegan, they joined Greg and I at the Elks club for dinner, eating the two vegan items on the menu, chips and salsa, while we enjoyed a tasty lasagna. I stepped outside to send my GPS signal for the day, and returned to see Greg and Sebastian in a bit of a heated discussion about America, as Sebastian had been talking about healthcare and homeless services being worse in America than Europe. I could see the veins popping out of Gregs neck as he explained, "If this is such a bad country, then why are you moving here? Why don't you move back to Germany or travel through Turkey or something!?" I think Sebastian meant no harm, and was rather oblivious to the tension but I honestly began to wonder if Greg was going to reach over the table and knock him out. Greg was a really friendly guy and he had literally put his life on the line every day for this country, so I could see how he could find this line of conversation offensive. I could tell he was losing his cool, whether it was a misunderstanding or not. Greg had the sense to toss me the hostel key and book a room at the Best Western, leaving before things got worse. Seb, Lexie, and I returned to the hostel and had some wonderful conversations about cycling, healthy eating, and our adventures, while they cooked some delicious vegan pasta and vegetables for my second meal. In the morning, they made some oatmeal and fruit and we left in separate directions. I had grown to love meeting new friends in this way, learning about each others cultures and perspectives, if even for a night. My free bunk at the "Shady Rest Motel"
I met Greg at his motel and we set off on another pleasantly overcast day and arrived in Murphysboro in the late afternoon. We enjoyed an incredible feast at a Mexican restaurant behind our motel, and stood out in front of our rooms talking to some other travelers while they sipped beers and smoked cigars. One of the men, a retired military officer, handed me a donation to the trip after several minutes of talking and exclaimed, "I am a good judge of character, and I don't need to look up what you are doing, I know you are doing something really good for people." This was just another one of the many random acts of kindness that I keep running into on this trip that have helped shape my optimistic view toward both humanity and our beautiful country. Thanks for reading and all the prayers, shares, comments, and donations. I truly appreciate all the support.